The Poydras Playground, opened on May 16, 1908 by the Outdoor Art Association, was located on the site of the old Pilie Market. 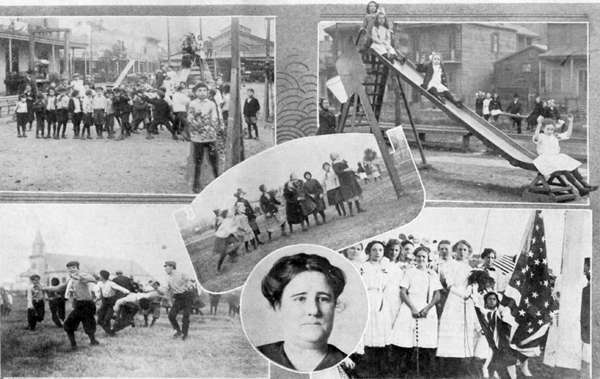 The St. Roch Playground at St. Roch and Roman was the third oldest of the city playgrounds, opening on June 26, 1910. The Cleveland Playground at Tulane and South Claiborne opened on September 26, 1909, and the Taylor Playground at Washington and Derbigny, on November 3, 1911. Top left, Group at Poydras; Top right, Using the slide at Cleveland; Center, Girls playing Basketball at St. Roch; Bottom left, Football at St. Roch; Center, Mrs. Mary Buckley, Supervisor at Poydras; Bottom right, Flag Raising at Taylor.